nos·tal·gi·a 1. A bittersweet longing for things, persons, or situations of the past.2. The condition of being homesick; homesickness. nostalgia 1. a yearning for the return of past circumstances, events, etc.2. the evocation of this emotion, as in a book, film, etc.3. longing for home or family; homesickness. Dear Followers, I am embarking on a 31 day post-a-thon inspired by the Nester. So, for the next 31 days, I will be posting about my chosen topic, nostalgia. I hope you will join me! Day 1: My Kindergarten Hand Plaque. My plaque is made out of clay. My children's are made of plaster. Who made a kindergarten hand plaque? 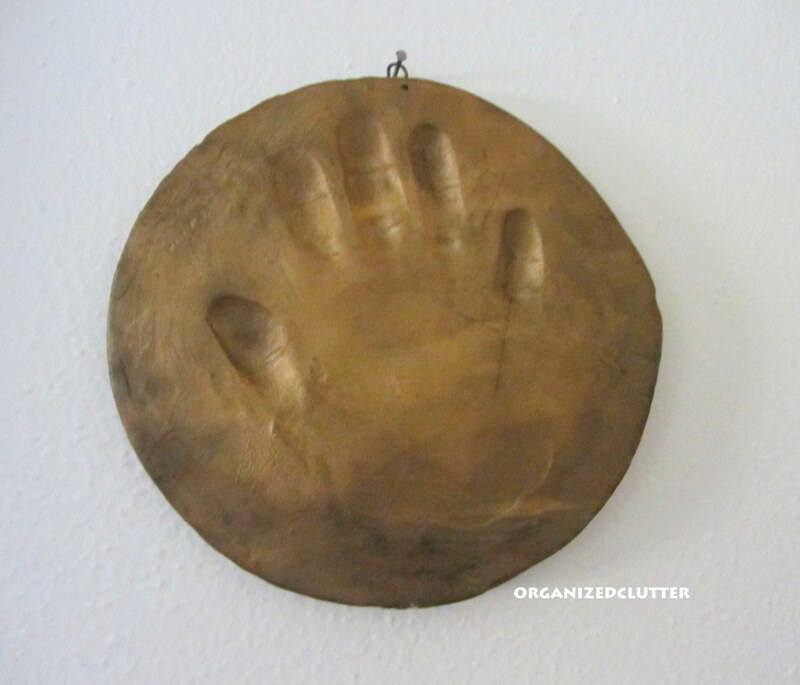 Who still has their kindergarten hand plaque? with their kids' plaques? I do. I love to decorate with my collections, family photos and past mementos. 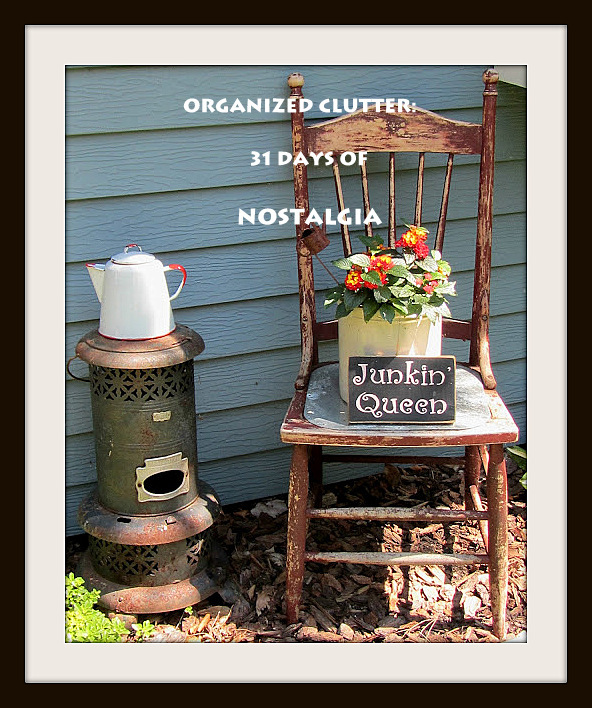 That's Day One of 31 Days of Nostalgia at Organized Clutter! 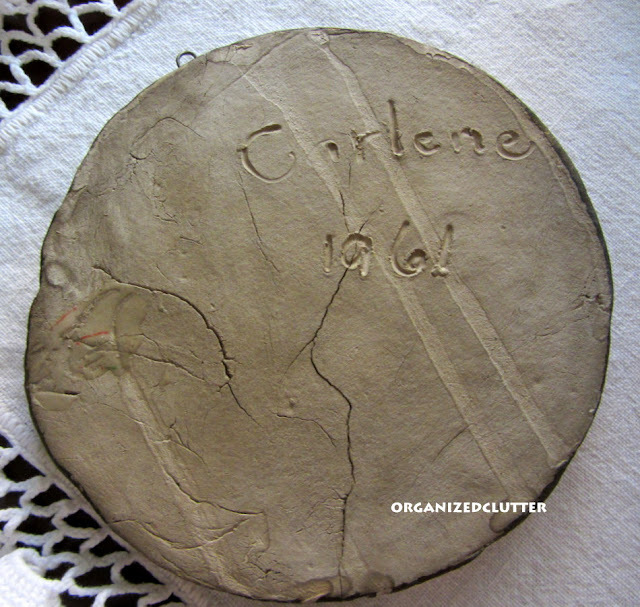 Carlene, I enjoy seeing your nostalgic things so it will be interesting to follow along with your month of nostalgia. 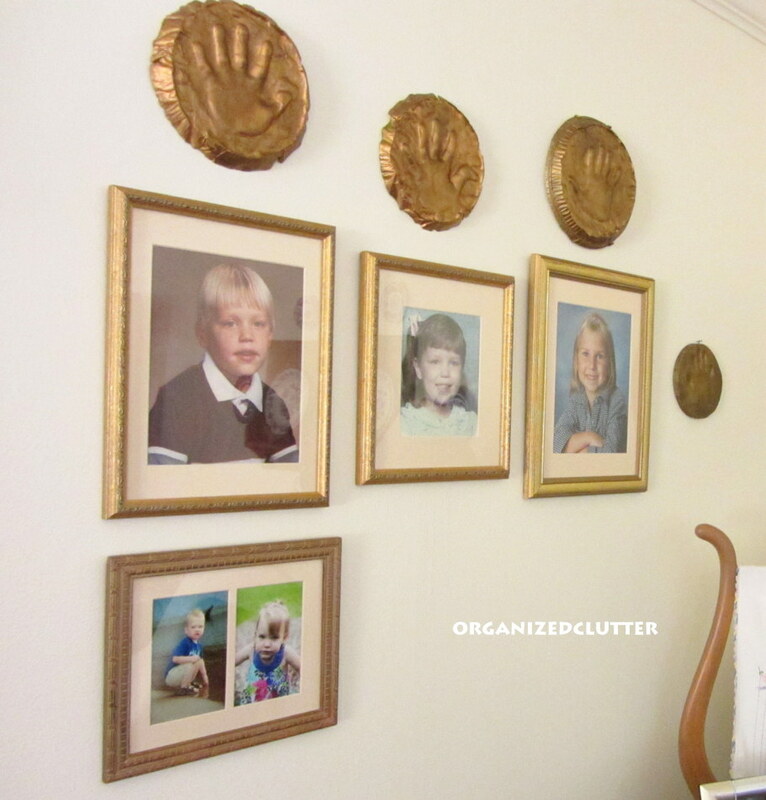 Displaying those hand prints with family photos is very special. Too many of us throw family things away thinking they are not important. Kudos to you for realizing that these things are important to a family's past and present. Have a good 31 days! I still have the handprint plaques from our daughters AND our dog. They aren't displayed at the moment, but stored carefully away. Looking forward to all of your nostalgia posts. Sadly, I don't think I have plaster casts of my children's hands. Love what you did with yours! They didn't have kindergarten when I was little, now that's funny isn't it. Now I'm jealous about the kindergarten hand plaques! lol I don't have one, nor do my kids! What a sweet post. I don't have a plaque of my hand print, but I'm so happy to still have the ones my boys did. OK, dating myself there wasn't kinder garden back in my day! But I would of loved to have gone and had my own hand print! I don't have a plaque neither for me or my kids! I like how you displayed yours! I don't know what ever happened to any hand plaques I did, but the other day I was thinking about a little paperweight I made in Sunday School and gave my dad for father's day when I was in like first grade. It was a clear circular thing with a picture of me that showed through. It was always on his dresser and he would put the money from his pocket under it when he got home. I wonder what happened to that. It pains me to think of treasures lost. I love that you have your hand print displayed with your kids'. Sweet memories! what a sweet idea. I wish I would have done that when mine were younger. Love all of your nostalgia. I had to comment on your kindergarten hand print. I have one almost exactly like it, except it is dated 1960. I currently have mine hanging near my art (etc.) inspiration boards. I wish I had done them for my girls when they were in kindergarten. I hope to do them with grandchildren one of these days.